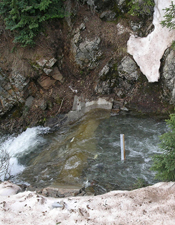 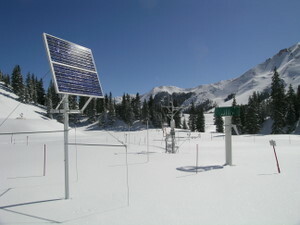 The Bureau of Land Management has provided a Special Use Permit to the CSAS for the Animas Valley Study Area located just six miles east of Silverton, and adjoining County Road 3, offering a convenient and safe site for visiting field camp faculty and students to use for snow profile exercises, as seen in the photograph below. 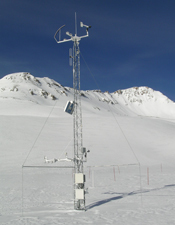 A weak, ‘continental’ snowpack structure is the norm and, while at the site, students can also observe an impressive array of nearby avalanche terrain and discuss the challenges of avalanche forecasting in a continental snow climate. 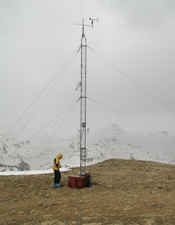 In the photo to the right, graduate and undergraduate students from Northern Arizona University performing a formal snowpack profile at the Animas Valley Study Area in late February, 2005 with their instructor Dr. Lee Dexter.